During the partial federal shutdown in December 2018 and January 2019, news reports showed furloughed government workers standing in line for donated meals. These images were reminders that for an estimated one out of eight Americans, food insecurity is a near-term risk. In California, where I teach, 80 percent of the population lives in cities. Feeding the cities of the nine-county San Francisco Bay Area, with a total population of some 7 million involves importing 2.5 to 3 million tons of food per day over an average distance of 500 to 1,000 miles. This system requires enormous amounts of energy and generates significant greenhouse gas emissions. It also is extremely vulnerable to large-scale disruptions, such as major earthquakes. And the food it delivers fails to reach 1 of every 8 people in the region who live under the poverty line – mostly senior citizens, children and minorities. Access to quality food is limited both by poverty and the fact that on average, California’s low-income communities have 32.7 percent fewer supermarkets than high-income areas within the same cities. 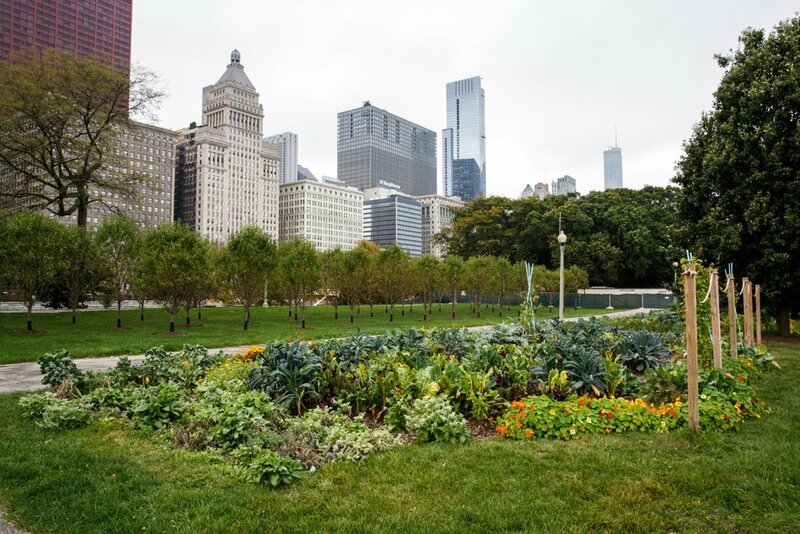 Many organizations see urban agriculture as a way to enhance food security. It also offers environmental, health and social benefits. Although the full potential of urban agriculture is still to be determined, based on my own research I believe that raising fresh fruits, vegetables and some animal products near consumers in urban areas can improve local food security and nutrition, especially for underserved communities. Urban farming has grown by more than 30 percent in the United States in the past 30 years. Although it has been estimated that urban agriculture can meet 15 to 20 percent of global food demand, it remains to be seen what level of food self-sufficiency it can realistically ensure for cities. One recent survey found that 51 countries do not have enough urban area to meet a recommended nutritional target of 300 grams per person per day of fresh vegetables. Moreover, it estimated, urban agriculture would require 30 percent of the total urban area of those countries to meet global demand for vegetables. Land tenure issues and urban sprawl could make it hard to free up this much land for food production. Other studies suggest that urban agriculture could help cities achieve self-sufficiency. For example, researchers have calculated that Cleveland, with a population of 400,000, has the potential to meet 100 percent of its urban dwellers’ fresh vegetable needs, 50 percent of their poultry and egg requirements and 100 percent of their demand for honey. Can Oakland’s Urban Farmers Learn from Cuba? Although urban agriculture has promise, a small proportion of the food produced in cities is consumed by food-insecure, low-income communities. Many of the most vulnerable people have little access to land and lack the skills needed to design and tend productive gardens. Cities such as Oakland, with neighborhoods that have been identified as “food deserts,” can lie within a half-hour drive of vast stretches of productive agricultural land. But very little of the twenty million tons of food produced annually within 100 miles of Oakland reaches poor people. Paradoxically, Oakland has 1,200 acres of undeveloped open space – mostly public parcels of arable land – which, if used for urban agriculture, could produce 5 to 10 percent of the city’s vegetable needs. This potential yield could be dramatically enhanced if, for example, local urban farmers were trained to use well-tested agroecological methods that are widely applied in Cuba to cultivate diverse vegetables, roots, tubers and herbs in relatively small spaces. In Cuba, over 300,000 urban farms and gardens produce about 50 percent of the island’s fresh produce supply, along with 39,000 tons of meat and 216 million eggs. Most Cuban urban farmers reach yields of 44 pounds (20 kilograms) per square meter per year. An organic urban farm in Cuba. If trained Oakland farmers could achieve just half of Cuban yields, 1,200 acres of land would produce 40 million kilograms of vegetables – enough to provide 100 kilograms per year per person to more than 90 percent of Oakland residents. To see whether this was possible, my research team at the University of California at Berkeley established a diversified garden slightly larger than 1,000 square feet. It contained a total of 492 plants belonging to 10 crop species, grown in a mixed polycultural design. In a three-month period, we were able to produce yields that were close to our desired annual level by using practices that improved soil health and biological pest control. They included rotations with green manures that are plowed under to benefit the soil; heavy applications of compost; and synergistic combinations of crop plants in various intercropping arrangements known to reduce insect pests. Achieving such yields in a test garden does not mean they are feasible for urban farmers in the Bay Area. Most urban farmers in California lack ecological horticultural skills. They do not always optimize crop density or diversity, and the University of California’s extension program lacks the capacity to provide agroecological training. The biggest challenge is access to land. University of California researchers estimate that over 79 percent of the state’s urban farmers do not own the property that they farm. Another issue is that water is frequently unaffordable. Cities could address this by providing water at discount rates for urban farmers, with a requirement that they use efficient irrigation practices. In the Bay Area and elsewhere, most obstacles to scaling up urban agriculture are political, not technical. In 2014 California enacted AB511, which set out mechanisms for cities to establish urban agriculture incentive zones, but did not address land access. One solution would be for cities to make vacant and unused public land available for urban farming under low-fee multi year leases. Or they could follow the example of Rosario, Argentina, where 1,800 residents practice horticulture on about 175 acres of land. Some of this land is private, but property owners receive tax breaks for making it available for agriculture. In my view, the ideal strategy would be to pursue land reform similar to that practiced in Cuba, where the government provides 32 acres to each farmer, within a few miles around major cities to anyone interested in producing food. Between 10 and 20 percent of their harvest is donated to social service organizations such as schools, hospitals and senior centers. Similarly, Bay Area urban farmers might be required to provide donate a share of their output to the region’s growing homeless population, and allowed to sell the rest. The government could help to establish a system that would enable gardeners to directly market their produce to the public. Cities have limited ability to deal with food issues within their boundaries, and many problems associated with food systems require action at the national and international level. However, city governments, local universities and nongovernment organizations can do a lot to strengthen food systems, including creating agroecological training programs and policies for land and water access. The first step is increasing public awareness of how urban farming can benefit modern cities. This article was written by Miguel Altieri, professor of Agroecology, University of California, Berkeley, for The Conversation.